After some random Googling I found a video which I had thought was lost (the original Youtube upload had been deleted). 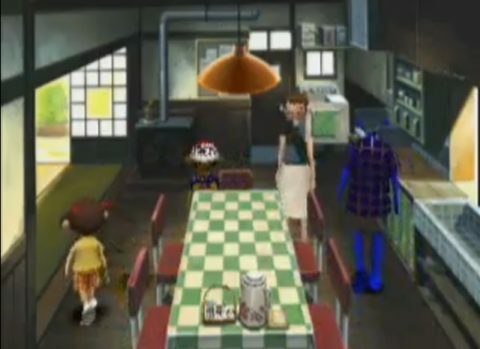 Here is a video of a glitch in the very first Boku holiday game on PS1. Japanese players discovered you could force the game to continue into a non-existent DAY 32 of the month, whereupon family members disappear and later, textures and audio go all wonky (around the 6.40 mark in this vid). This is both freaky and awesome, like some kind of deranged twilight zone. Notice how the father is made up of blue polygons and isn’t fully formed, while the mom’s abdomen is missing entirely. This reminds of the subject regarding game glitches which behave as games in themselves. Such as Mario’s Minus World, NES Metroid’s hidden worlds, Zelda 64’s red screen world, a maze of platforms hidden behind the ice scenery in Donkey Kong Country, and a tiny handful of other games which I can’t quite recall. For those interested in Boku no Natsuyasumi, there's the series of diary entries I did a while ago. a simular error happens when zelda: majora's mask goes into day 4.
not heard of the red screen world or the donkey kong one though. Hey Sketcz when are you going to review Kokoro Scan?